One of my Gastroparesis friends brought this medication to my attention this morning. A special thanks to Robin for kping me informed about these trials. Some of these trials were done a year ago, while some of these are up to date. I wanted to include them all so that the progression of these clinical trials can be seen. It gives me hope that there are clinical trials being conducted to help find a less invasive way to help motility in those who have Gastroparesis. "Velusetrag is an oral, investigational medicine developed for gastrointestinal motility disorders. It is a highly selective agonist with high intrinsic activity at the human 5-HT4 receptor and is being developed in collaboration with Alfa Wassermann in a Phase 2 program to test its efficacy, safety and tolerability in the treatment of patients with gastroparesis. A Phase 2b study is currently underway following positive top-line results from a Phase 2 proof-of-concept trial. Axelopran (TD-1211) is a once-daily, oral peripherally active mu opioid receptor antagonist being developed for the treatment of opioid induced constipation (OIC). Axelopran, which has completed long term toxicology studies, is intended to normalize bowel function without impacting analgesia. As a stand-alone treatment, Axelopran has been successfully advanced through Phase 2 studies, demonstrating a rapid restoration of normal bowel function followed by maintenance in OIC patients compared to placebo. Phase 2 study data also shows statistically significant improvements in a range of gastrointestinal symptoms in OIC patients for Axelopran as compared to placebo. We are refining the development and commercial strategy for both single agent and a fixed-dose combination of Axelopran, as well as speaking with potential collaborators. We believe that pairing Axelopran and an opioid in a fixed-dose combination (FDC) could present an important market opportunity, as it has the potential to provide pain relief without constipation in a single abuse-deterrent pill for patients using opioids on a chronic basis. To this end, we have developed a proprietary spray-coating technology and applied it to the creation of a FDC of Axelopran and controlled-release Oxycodone. To date, we have successfully conducted a Phase 1 study of our novel Axelopran FDC, showing that our proprietary spray-coating formulation allowed Oxycodone to be coated with Axelopran in a single pill without any modification of oxycodone, its activity or abuse-deterrent characteristics. Based on our work to date, we believe our spray-coating technology is applicable to a broad range of opioids, allowing for a potential FDC platform. We are refining the development and commercial strategy for both single agent and a FDC of Axelopran, as well as speaking with potential collaborators. TD-8954 is a selective 5-HT4 receptor agonist being investigated for potential use in the treatment of gastrointestinal motility disorders, including enteral feeding intolerance ("EFI"). Millennium Pharmaceuticals, Inc., a wholly-owned subsidiary of Takeda Pharmaceutical Company Limited has a global license, development and commercialization agreement for TD-8954 for potential use in the treatment of gastrointestinal motility disorders, including short-term intravenous use for EFI to achieve early nutritional adequacy in critically ill patients at high nutritional risk, for which TD-8954 received U.S. Food and Drug Administration (FDA) Fast Track Designation. TD-1473 is an intestinally restricted pan-janus kinase (JAK) inhibitor that has demonstrated a high affinity for each of the JAK family of enzymes (JAK1, JAK2, JAK3 and TYK2). Through the inhibition of these enzymes, TD-1473 interferes with the JAK/STAT signaling pathway and, in turn, modulates the activity of a wide range of pro-inflammatory cytokines. Importantly, as an intestinally restricted treatment, TD-1473 is specifically designed to distribute adequately and exclusively to the tissues of the intestinal tract and to minimize systemic exposure. As such, we believe that this novel approach to JAK inhibition has the potential to treat inflammation in the tissues of the intestinal tract while minimizing the risk of systemic side effects. We are conducting a Phase 1 clinical study of TD-1473." Image Source: Located on the image. This is a multicenter, randomized, double-blind, incomplete block, three period fixed sequence crossover, multicenter, placebo-controlled study. The study will assess three oral doses of velusetrag (5 mg, 15 mg, and/or 30 mg) or placebo, administered once daily in three periods of 1-week duration each, with a 1-week washout period between treatment periods, in subjects with diabetic or idiopathic gastroparesis. Study 0093 will evaluate the effect of Velusetrag in subjects with diabetic or idiopathic gastroparesis by assessing changes in gastric emptying. Velusetrag (INN, USAN; previously known as TD-5108) is an experimental drug candidate for the treatment of gastric neuromuscular disorders including gastroparesis, and lower gastrointestinal motility disorders including chronic idiopathic constipation and irritable bowel syndrome. It is a potent, selective, high efficacy 5-HT4 receptor serotonin agonist  being developed by Theravance Biopharma and Alfa Wassermann. Velusetrag demonstrates less selectivity for other serotonin receptors, such as 5-HT2 and 5-HT3, to earlier generation 5-HT agonists like cisapride and tegaserod. In a large clinical trial in patients with chronic idiopathic constipation (n=401), velusetrag statistically and clinically improved the frequency and consistency of complete spontaneous bowel movements (CSBMs) compared to placebo. Doses of 15 and 30 mg were well tolerated compared to placebo. Velusetrag showed accelerated intestinal and colonic transit after single dosing and accelerated gastric emptying after multiple dosing in healthy volunteer subjects. In addition, velusetrag showed accelerated gastric emptying in patients with diabetic or idiopathic gastroparesis. The proportion of patients who experienced at least a 20% improvement is gastric emptying ranged from 20% to 52% for velusetrag dosed patients and 5% for placebo patients. On December 6, 2016, Theravance Biopharma announced that the U.S. Food and Drug Administration (FDA) has granted Fast Track designation to velusetrag for the treatment of symptoms associated with diabetic and idiopathic Gastroparesis. As of May 10, 2017, Velusetrag is being studied, at doses of 5, 15 and 30 mg over a 12 week treatment period, for symptomatic improvement in patients with diabetic or idiopathic gastroparesis in the DIGEST study." "WHO Drug Information, Vol. 24, No. 1, 2010. International Nonproprietary Names for Pharmaceutical Substances (INN). Recommended International Nonproprietary Names: List 63" (PDF). World Health Organization. p. 79. Retrieved 26 April 2016. M. Vazquez-Roque, and M. Camilleri (2011). "Velusetrag". Drugs of the Future. 36 (6): 447–454. doi:10.1358/dof.2011.036.06.1594078. Smith, JA; Beattie, DT; Marquess, D; Shaw, JP; Vickery, RG; Humphrey, PP (2008). "The in vitro pharmacological profile of TD-5108, a selective 5-HT(4) receptor agonist with high intrinsic activity". Naunyn-Schmiedeberg's archives of pharmacology. 378 (1): 125–37. doi:10.1007/s00210-008-0282-y. PMID 18415081. "Theravance Biopharma: Programs". Theravance Biopharma. Retrieved 2017-05-10. "Theravance and Alfa Wassermann Enter Into Agreement to Develop and Commercialize Velusetrag for Gastroparesis". www.sec.gov. Retrieved 2017-05-10. Goldberg, M; Li, YP; Johanson, JF; Mangel, AW; Kitt, M; Beattie, DT; Kersey, K; Daniels, O (2010). "Clinical trial: The efficacy and tolerability of velusetrag, a selective 5-HT4 agonist with high intrinsic activity, in chronic idiopathic constipation - a 4-week, randomized, double-blind, placebo-controlled, dose-response study". Alimentary pharmacology & therapeutics. 32 (9): 1102–12. doi:10.1111/j.1365-2036.2010.04456.x. PMID 21039672. Manini, ML; Camilleri, M; Goldberg, M; Sweetser, S; McKinzie, S; Burton, D; Wong, S; Kitt, MM; et al. (2010). "Effects of Velusetrag (TD-5108) on gastrointestinal transit and bowel function in health and pharmacokinetics in health and constipation". Neurogastroenterology and motility : the official journal of the European Gastrointestinal Motility Society. 22 (1): 42–9, e7–8. doi:10.1111/j.1365-2982.2009.01378.x. PMC 2905526 Freely accessible. PMID 19691492. "Theravance Biopharma Presents Positive Phase 2 Study Data on Velusetrag (TD-5108) for Treatment of Gastroparesis in "Poster of Distinction" at Digestive Disease Week (DDW) 2015 (NASDAQ:TBPH)". investor.theravance.com. Retrieved 2017-05-10. House, SA Editor Douglas W. (2015-05-18). "Theravance's velusetrag performs well in gastroparesis study". Seeking Alpha. Retrieved 2017-05-10. Morales, Sysy (2016-12-18). "FDA Gives Fast Track Designation for Gastroparesis Treatment". Diabetes Daily. Retrieved 2017-05-10. "The Diabetic and Idiopathic Gastroparesis Efficacy, Safety, and Tolerability (DIGEST) Study". ClinicalTrials.gov. Retrieved 26 April 2016. "Velusetrag has been used in trials studying the treatment of Gastroparesis and Alzheimer's Disease. It is a highly selective serotonin receptor agonist effective in patients with chronic constipation. It is being developed by Theravance. Velusetrag was discovered by Theravance through the application of its multivalent drug design in a research program dedicated to finding new treatments for GI motility disorders." DUBLIN, Ireland, Aug. 2, 2017 /PRNewswire/ -- Theravance Biopharma, Inc. (NASDAQ: TBPH) ('Theravance Biopharma' or the 'Company') today announced positive results from a 12-week, Phase 2b study of velusetrag (TD-5108), an oral investigational drug in development for the treatment of patients with diabetic and idiopathic gastroparesis. Top-line results from the study demonstrated statistically significant improvements in gastroparesis symptoms and gastric emptying in patients receiving 5 mg of velusetrag as compared to placebo. Additionally, velusetrag was shown to be generally well-tolerated, with 5 mg and placebo having comparable rates of adverse events (AEs) and serious adverse events (SAEs). The study was a multicenter, double-blind, placebo-controlled, parallel group Phase 2b characterizing the impact on symptoms and gastric emptying of multiple doses of velusetrag administered once daily over 12 weeks of therapy. The study enrolled 232 subjects with diabetic or idiopathic gastroparesis with documented gastric delay, by either gastric emptying scintigraphy (GES) or gastric emptying breath test (GEBT), and documented symptoms prior to and throughout the baseline period. Two daily patient reported outcomes (PRO) tools were used to characterize symptom change: the Gastroparesis Cardinal Symptom Index (GCSI), which assessed the severity of three cardinal symptom domains; and the Gastroparesis Rating Scale (GRS), which assessed severity, frequency and timing of seven symptom domains, including the three symptom domains in the GCSI. GRS is a proprietary PRO tool being developed by the Company with academic collaboration. The primary endpoint in the study was mean GCSI score at the end of week 4 of the treatment period. Velusetrag is an oral, once-daily investigational medicine discovered internally and developed for gastrointestinal motility disorders. The compound has been granted Fast Track designation by the U.S Food and Drug Administration (FDA) for the treatment of symptoms associated with idiopathic and diabetic gastroparesis. Velusetrag is a highly selective agonist with high intrinsic activity at the human 5-HT4 receptor. 5-hydroxytryptamine receptor 4 (5-HT4) agonists are established as gastrointestinal (GI) prokinetic agents for the treatment of GI tract dysfunction, such as chronic constipation. Velusetrag (or TD-5108) is a 5-HT4 receptor agonist that demonstrates high in vitro intrinsic activity and selectivity for the 5-HT4 receptor and has no significant affinity for all other receptor types, ion channels, or enzymes tested. A previous Phase 2 trial of velusetrag showed that all three doses of velusetrag (5, 15 and 30 mg) reduced gastric emptying time (GE t1/2) compared to placebo in patients with either diabetic or idiopathic gastroparesis. The completed Phase 2 trial was the first study to evaluate gastric emptying, a diagnostic criterion for gastroparesis, in a patient population including both diabetic and idiopathic gastroparesis patients, as opposed to diabetic gastroparesis patients only. In addition, velusetrag has completed a 400-patient Phase 2 proof-of-concept study in chronic idiopathic constipation, demonstrating statistically significant prokinetic activity at all three doses tested in that study. Velusetrag is being developed by Theravance Biopharma in collaboration with Alfasigma (S.p.A.) ("Alfasigma"). Under the terms of the agreement, Alfasigma has an exclusive option to develop and commercialize velusetrag in the European Union, Russia, China, Mexico and certain other countries, while Theravance Biopharma retains full rights to velusetrag in the United States, Canada, Japan and certain other countries. Theravance Biopharma is a diversified biopharmaceutical company with the core purpose of creating medicines that make a difference in the lives of patients suffering from serious illness. Our pipeline of internally discovered product candidates includes potential best-in-class medicines to address the unmet needs of patients being treated for serious conditions primarily in the acute care setting. VIBATIV® (telavancin), our first commercial product, is a once-daily dual-mechanism antibiotic approved in the U.S., Europe and certain other countries for certain difficult-to-treat infections. Revefenacin (TD-4208) is a long-acting muscarinic antagonist (LAMA) being developed as a potential once-daily, nebulized treatment for chronic obstructive pulmonary disease (COPD). Our neprilysin (NEP) inhibitor program is designed to develop selective NEP inhibitors for the treatment of a range of major cardiovascular and renal diseases, including acute and chronic heart failure, hypertension and chronic kidney diseases, such as diabetic nephropathy. Our research efforts are focused in the areas of inflammation and immunology, with the goal of designing medicines that provide targeted drug delivery to tissues in the lung and intestinal tract in order to maximize patient benefit and minimize risk. The first program to emerge from this research is designed to develop intestinally restricted pan-Janus kinase (JAK) inhibitors for the treatment of a range of inflammatory intestinal diseases. This press release and the conference call will contain contains certain 'forward-looking' statements as that term is defined in the Private Securities Litigation Reform Act of 1995 regarding, among other things, statements relating to goals, plans, objectives, expectations and future events. Theravance Biopharma intends such forward-looking statements to be covered by the safe harbor provisions for forward-looking statements contained in Section 21E of the Securities Exchange Act of 1934 and the Private Securities Litigation Reform Act of 1995. Examples of such statements include statements relating to: the company's strategies, plans and objectives, the company's regulatory strategies and timing of clinical studies, the potential benefits and mechanisms of action of the company's product and product candidates, the company's expectations for product candidates through development, potential regulatory approval and commercialization (including their potential as components of combination therapies) and the company's expectations for product sales. These statements are based on the current estimates and assumptions of the management of Theravance Biopharma as of the date of the press release and are subject to risks, uncertainties, changes in circumstances, assumptions and other factors that may cause the actual results of Theravance Biopharma to be materially different from those reflected in the forward-looking statements. Important factors that could cause actual results to differ materially from those indicated by such forward-looking statements include, among others, risks related to: delays or difficulties in commencing or completing clinical studies, the potential that results from clinical or non-clinical studies indicate the company's product candidates are unsafe or ineffective (including when our product candidates are studied in combination with other compounds),the feasibility of undertaking future clinical trials for our product candidates based on FDA policies and feedback, dependence on third parties to conduct clinical studies, delays or failure to achieve and maintain regulatory approvals for product candidates, risks of collaborating with or relying on third parties to discover, develop and commercialize product and product candidates, and risks associated with establishing and maintaining sales, marketing and distribution capabilities with appropriate technical expertise and supporting infrastructure. Other risks affecting Theravance Biopharma are described under the heading 'Risk Factors' contained in Theravance Biopharma's Form 10-Q filed with the Securities and Exchange Commission (SEC) on May 9, 2017 and Theravance Biopharma's other filings with the SEC. In addition to the risks described above and in Theravance Biopharma's filings with the SEC, other unknown or unpredictable factors also could affect Theravance Biopharma's results. No forward-looking statements can be guaranteed and actual results may differ materially from such statements. Given these uncertainties, you should not place undue reliance on these forward-looking statements. Theravance Biopharma assumes no obligation to update its forward-looking statements on account of new information, future events or otherwise, except as required by law. 1 American Gastroenterological Association. 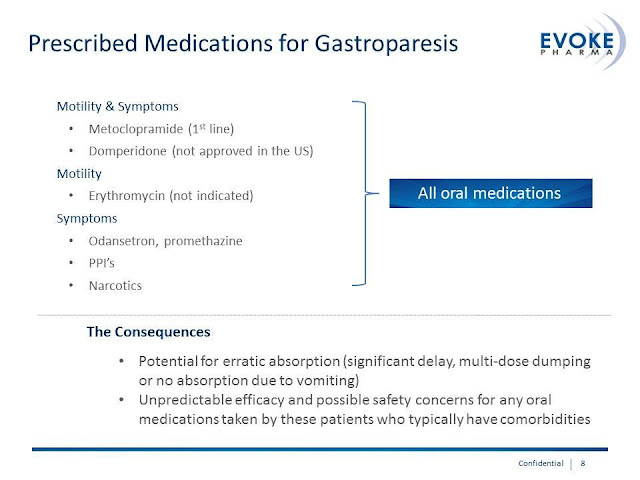 "Technical Review on the Diagnosis and Treatment of Gastroparesis." http://www.gastrojournal.org/article/S0016-5085(04)01634-8/fulltext. Published online July 27, 2005. 2 Journal of Neurogastroenterology and Motility. 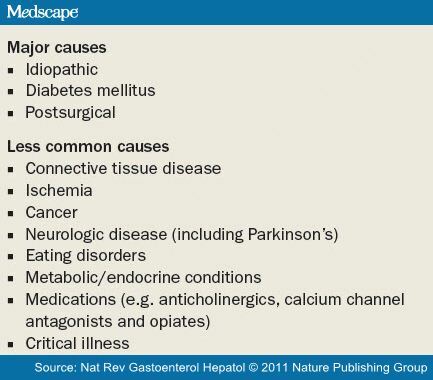 "Prevalence of Hidden Gastroparesis in the Community: The Gastroparesis 'Iceberg'." http://www.jnmjournal.org/journal/view.html?doi=10.5056/jnm.2012.18.1.34. Published online January 16, 2012."